The no.4 seeds, they were beaten in the final by Singapore’s Gao Ning and Yu Mengyu, the top seeds (12-10, 12-10, 11-9). Defeat for the English duo but they had their chances, as opposed to being two games to nil in arrears, they could have been two games to nil ahead. In the opening game they led 10-9, in the second 10-8; the score-line was closer than a straight games margin suggested. The win for Gao Ning and Yu Mengyu followed success for Sathiyan Gnanasekaran and Manika Batra in an all Indian bronze medal contest, the no.2 seeds they accounted for Sharath Kamal Achanta and Mouma Das, the no.3 seeds (11-6, 11-2.11-4). 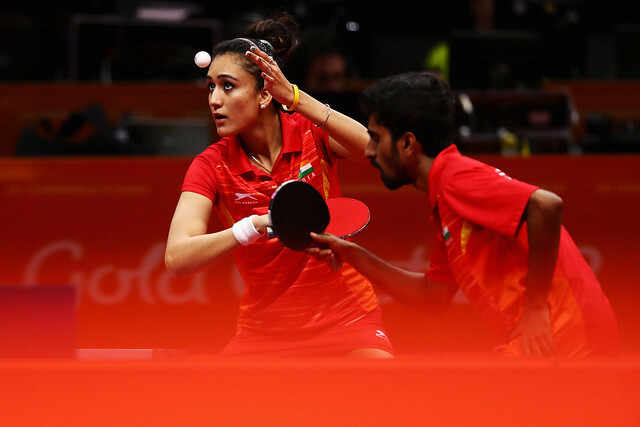 Moreover the faced their respective Men’s Doubles and Women’s Doubles partners with whom earlier in the proceeding they had won silver medals; Sathiyan Gnanasekaran had partnered Sharath Kamal Achanta, Manika Batra had joined forces with Mouma Das. The match was very much a non-event and begs the question as to whether there should be two bronze medals; the argument is that you should win the bronze not gain the medal through defeat. It is the combat sports that have two bronze medals but is table tennis not like boxing or similar? It is battle between two teams or two players?